Patrick Ssenyonjo, stage name Fresh Kid has been awarded scholarship by Ruparelia Group, to study at Kampala Parents School. The seven-year-old rapper got the scholarship after meeting Ruparelia Group Managing Director, Rajiv Ruparelia on Friday 12th April 2019. Fresh Kid will now be attending Kampala parents school, a day school which allows him to do his music as well. “I was moved by his ambitions being only seven years old. I would love to see him become a guide and inspiration to many young people out there hence; Ruparelia Foundation is presenting this young man with a full scholarship from the Ruparelia Foundation to go to Kampala parents,” Rajiv said. This young Juvenile’s talent and career nearly faced suffocation when Florence Nakiwala Kiyinji, the State Minister for Youth and Children’s Affairs, commanded Fresh Kid to return to School and concentrate on his studies and stop singing. 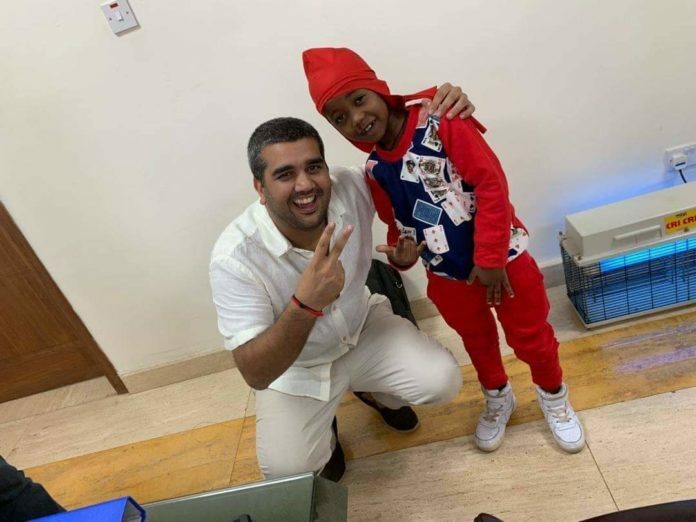 But Fresh Kid pleaded to the Minister through a song titled “Bambi” asking her kindly to let him sing because his music has changed and contributed a lot to his parent’s lifestyle as well as his own. Later, after the two met, Minister Kiyingi gave Fresh Kid a green light to continue with his music, but on condition that he will go to school and also present his termly report to the Minister as a way of monitoring his performance. He was also told to sing only on weekends during school days. Minster Kiyingi, on top of the rules and regulations imposed on Fresh Kid, she vowed to pay his school fees up to P.7. Fresh Kid was then to relocate from his current school St. Agnes Primary School Kawanda, to St Savio Kisubi the Ministers choice. But Fresh Kid rejected the School because it’s a boarding school. His argument was that he will not have time for his music when studying in a boarding school. So, the Kampala Parent’s scholarship best suits this Juvenile’s talent because he will now be able to balance school and his career. Fresh Kid’s talent has opened gates and opportunities for him because now he will be attending one of the best schools in the Country.